Raised in Moro, a small rural community in east Arkansas, Lauren Waldrip learned much from that front-porch culture. She was introduced to a strong work ethic as a kid. From driving a tractor to laying polypipe, she was a great help to her dad’s business. Fifth generation of an Arkansas farm family, Lauren was surrounded by row crops, namely soybeans, and grew up without the interference of stoplights or stop signs. Those days taught her that the more time she put into her crops, the more she would be rewarded at harvest time. 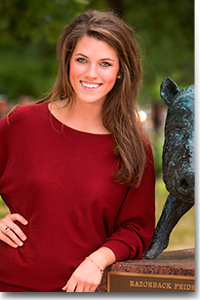 Lauren was destined to attend the University of Arkansas, as has every member of her immediate family. Her parents, Mark and Angela, graduated in the late 70s. 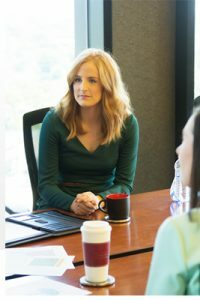 Lauren, now an MBA student at the Sam M. Walton College of Business, majored in both marketing and public relations with a minor in accounting. “During my first semester, I was undeclared,” she says. If asked, Lauren’s friends will easily describe her as a sports fanatic. She remembers calling the Hogs at a very early age. She even turned her passion into a professional activity. Lauren’s involvement with the athletic department on both a professional and personal level was something that enhanced her college experience. She knows that the Razorbacks have a positive effect on recruiting, enrollment, the UA campus, and on Northwest Arkansas as a whole. Lauren is as passionate about her career as she is about the Razorbacks. When she interned in 2011 as a legislative assistant for U.S. Senator John Boozman, she chose agriculture as her focus. She wrote press releases for Boozman’s website, attended legislative hearings and corresponded with constituents. She also served as student body Vice President, and created a Collegiate Membership specifically for students while recently working at the Razorback Foundation. The program garnered more than 2,200 members in its first year. She is well aware that “a college degree is no longer all it takes to be competitive in today’s markets” and recognizes the significance of a master’s degree to take her place among business leaders. As a native Arkansan, Lauren knows the impact of the Sam M. Walton College of Business in state, national, and international levels and believes this opportunity is a vital step for her future success. She is excited to learn new perspectives on business and problem-solving from a diverse group of faculty whose teaching skills she has already witnessed. The dynamic market of Northwest Arkansas is another reason she chose the Walton MBA. 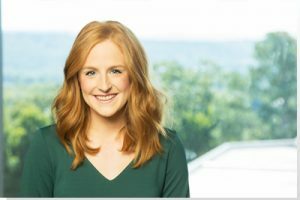 Leveraging the Graduate School of Business’ relationships in area corporate offices, Lauren is gaining practical work experience and establishing a strong business network. Lauren says she finds her motivation on a daily basis through her relationship with the Lord. She feels she has received many blessings during her time in Fayetteville and strives to glorify Him through all those experiences by sharing the joy of the Lord with others. Drew graduated from Harding University in 2006, where he majored in English and played football for 5 years. The summer after he graduated from Harding, Drew married Becky Bowerman and moved to St. Louis, Missouri, where he attended the Washington University School of Law. 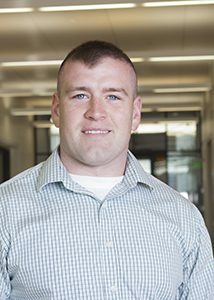 In 2009, Drew graduated law school and commissioned as an officer in the United States Marine Corps to become a judge advocate. After completing initial officer training, Drew reported to Camp Lejeune in North Carolina. While at Camp Lejeune, Drew put his legal training to good use, serving as a civil law attorney, trial counsel (military prosecutor), and, later, as the Deputy Staff Judge Advocate to the Commanding General of Marine Corps Installations East-Marine Corps Base Camp Lejeune, a command that consists of all Marine Corps installations on the east coast. Once his tour in the Marine Corps was completed, Drew and his wife knew that they were returning home to Northwest Arkansas. Marines are trained to be focused and decisive, so Drew knew exactly what he had to do. Drew started the Walton Executive MBA program in 2013. When Drew began to look at MBA possibilities, he recognized that he would need a program that allowed him to balance work, home, and school. As a Legislative Research Manager in Wal-Mart’s Compliance Department, Drew monitors and interprets pending state and federal legislation on non-food products and chemicals while providing his interpretation to managing teams. The Walton Executive MBA program has helped Drew become more familiar with the corporate world. Having been introduced into business culture, he has also discovered new ways to utilize his experience and leadership training. Brooke grew up in Rogers, Ark., and makes the short trip to Rogers from Fayetteville frequently to see her family. When she’s not at school, she enjoys spending time on the lake, attending her little sister’s events, trying new recipes with her mom, and volunteering for the Make-A-Wish Foundation. Brooke says she is confident that choosing to earn her degree from the Walton College was the right decision. Last summer she worked at Nielsen in the Bentonville office as a summer intern on the Walmart team. Her project primarily focused on analyzing the explosive growth of Neighborhood Market stores and the effect the growth would have on Walmart. In her analysis she looked at demographics to compare the key shoppers at Neighborhood Market stores to Supercenters, sales data to determine the key categories at Neighborhood Market stores, and issues surrounding cannibalization of sales due to the close proximity of Neighborhood Market stores and Supercenters. Brooke says the MBA program has introduced her to new ways of thinking, presented opportunities for professional development, and surrounded her with great students and faculty. 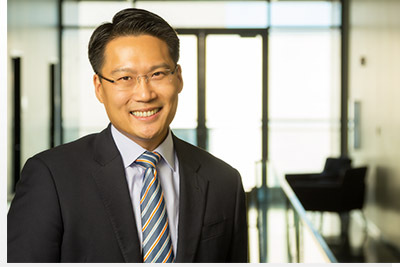 The Walton Executive MBA (EMBA) program is an important step along Nien Su’s path toward this goal. Nien works at Walmart as the director of International Government Affairs supporting Walmart’s business in China, Japan and India. Nien grew up in Taiwan and Southern California. He and his family moved to Rowland Heights, California when he was 5 years old. He is fluent in Chinese and English. He watched his parents make tremendous sacrifices to start a new life in a new country and this gave him the drive to succeed at whatever he does and make the most of opportunities available to him. Nien began his career in the public sector. He served eight years as head of Asia-Pacific for the House Committee on Foreign Affairs in Washington, DC. He also worked in China as a consultant and served in various positions at the State Department during the Bush Administration. Although he enjoyed his roles in the public sector, Nien recently transitioned to working in the corporate sector. He moved to northwest Arkansas to work at Walmart, where he currently serves as Director of International Government Affairs. He provides support for Walmart’s business in China, Japan, and India. 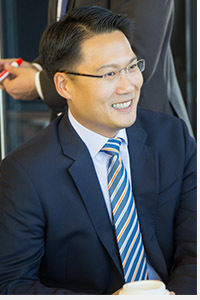 The decision to pursue a graduate degree in business was guided by his desire to learn the fundamentals of global business. He felt that furthering his education would facilitate the transition from public to corporate sector and further his career growth and potential. 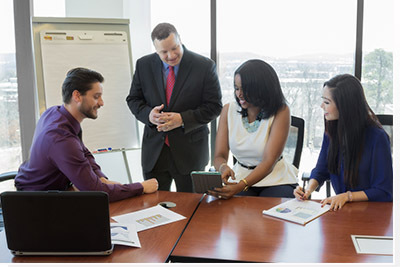 The EMBA program provides the perfect fit. 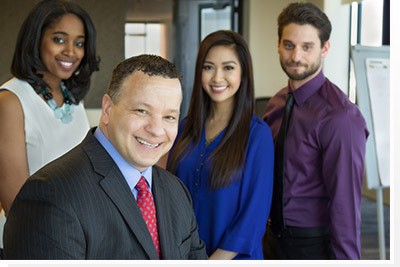 It is a part-time program designed for working professionals. Students attend class on campus one Saturday a month and complete the remaining coursework online. The program format is especially helpful for students like Nien who travel frequently as part of their jobs. Being a director of international business requires domestic and oversees travel. Nien is able to balance his travel schedule with the Walton College EMBA program, although it does take careful planning and result in some unexpected activities, like carrying his statistics textbook around the globe. He even found a note from TSA that they had checked the book on a recent business trip. Nien is happy with his decision. Emily Harbuck is a native Arkansan who appreciates the creative side of business. While working at General Mills, Emily Harbuck is pursuing an EMBA degree. Emily knew she wanted to find a corporate job that would allow her to develop innovative approaches and apply them to business strategies. Her first step toward meeting this was goal to complete a Marketing degree at the University of Arkansas, with minors in Management and Art. Emily participated in Leadership Walton while she was working toward her degree and credits this program for molding her into the professional she is today. This program, designed to provide developmental opportunities to business majors, was her introduction to all the Walton College had to offer. Now that she is well established in her career, when it came time to pursue additional education she knew where to look. 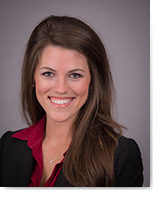 Emily currently works as a Marketing Communication Senior Planner for General Mills. She works closely with Sam’s Club merchandising and marketing teams to plan in and out of club promotional events, such as Box Tops for Education and Outnumber Hunger. Even though she loves her job, Emily was ready to further her education. 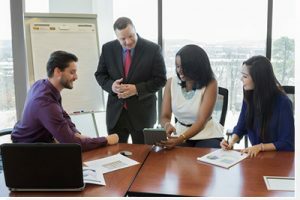 At this stage in her career the perfect fit came in the form of the Walton Executive MBA (EMBA) program. The EMBA program is a two-year curriculum where working professionals attend classes in-person one Saturday a month. This face-to-face classroom setting is combined with online coursework to allow the flexibility required by students’ work responsibilities. The EMBA program’s reputation in the market and helpful staff factored into her decision to pursue the program. Emily also values the quality of students and professors and has taken advantage of the networking opportunities provided by the EMBA program. One place you might find Mitch Heisserer is snowboarding in the Colorado mountains. He is adventurous and always up for a challenge, including the pursuit of a graduate degree. Mitch researched many different options before finding the program that was right for him. 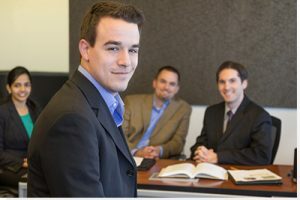 Mitch chose to earn his degree at the Walton College instead of Colorado, although he would miss out on a lot of snowboarding, because the business analytics program met the criteria he was looking for in a graduate program. Mitch says the short-term sacrifice is already paying off. With a busy professional life, and a family to look out for, Jael spent two years researching programs before finally choosing to join the Walton College. Jael’s work experience is extensive. 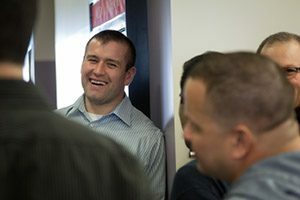 His career started in Iowa, his home state, with IBP (Iowa Beef Processors). A few years after the company was acquired by Tyson Foods, Jael relocated to NWA as a Senior Buyer. Then, in 2008, he left NWA to pursue a new opportunity with HNI Corporation. After a period of time at HNI, Jael returned to NWA to work for Sam’s Club in inventory management and logistics. Five years later, Jael now works for The Hain Celestial Group managing replenishment, logistics, and sales analytics. His advice for future students, “Know what you want. Be prepared to stretch yourself in order to achieve your goals. Do not expect handouts, and know you have to earn every grade. 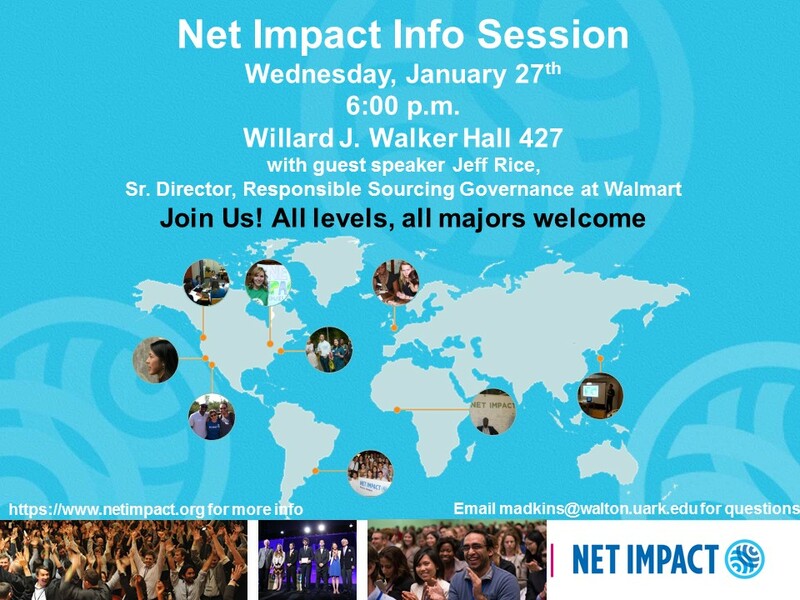 University of Arkansas students are invited to attend an information session about Net Impact on Wednesday, Jan. 27, at 6 p.m. in Willard J. Walker Hall, room 427. This informational meeting will kick start the first Net Impact chapter at the University of Arkansas. The chapter will be a new student organization that encourages social and environmental changes on campus and through the workplace. It is open to all University of Arkansas students. Attend an information session about Net Impact on Wednesday, Jan. 27, 2016, at 6 p.m. in Willard J. Walker Hall, room 427. Jeff Rice, senior director, Responsible Sourcing Governance at Walmart, will be the guest speaker. Rice previously served as director of sustainability at Walmart and director of IT systems and strategy at The Sustainability Consortium. He holds an M.B.A. from the University of Arkansas. Net Impact is a globally recognized membership organization that focuses on intractable global problems from poverty to climate change. It has more than 80,000 members across the globe, and a vibrant chapter network. Net Impact chapters provide professional skill building, networking and experiential learning opportunities to help students and professionals incorporate sustainability into their careers. Activities include networking events, campus campaigns, service projects, career development, fundraisers, community partnerships, conferences, speakers, case competitions and more. Walton College’s Jon Johnson, professor of sustainability and chairman of The Sustainability Consortium, and David Hyatt, professor of supply chain management, serve as faculty advisers. Adkins and Eric Boles, director of sustainability, Office for Sustainability, University of Arkansas, serve as organization sponsors. 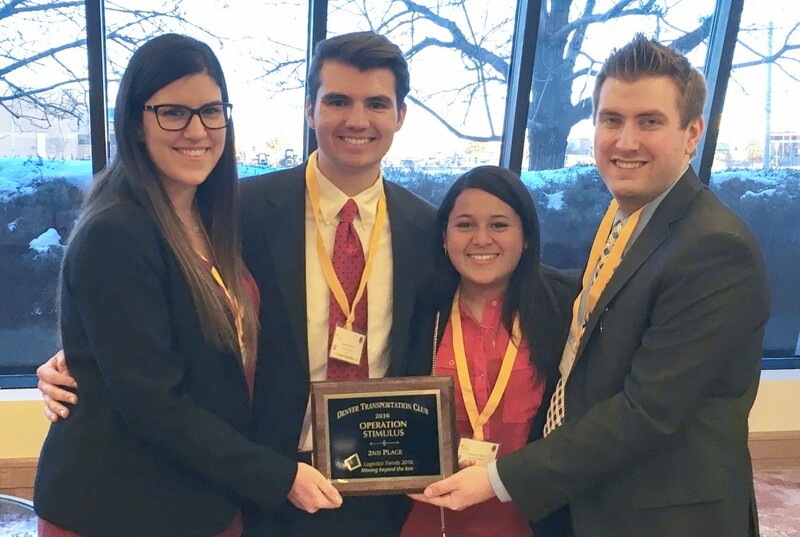 Four Walton College students traveled to New York with Center for Retailing Excellence staff members to attend the National Retail Federation 2016 Big Show Student Program Jan. 14-17. They joined nearly 500 students representing more than 50 universities around the country for the retail conference, which provided students opportunities for internships, employment, training programs and networking. 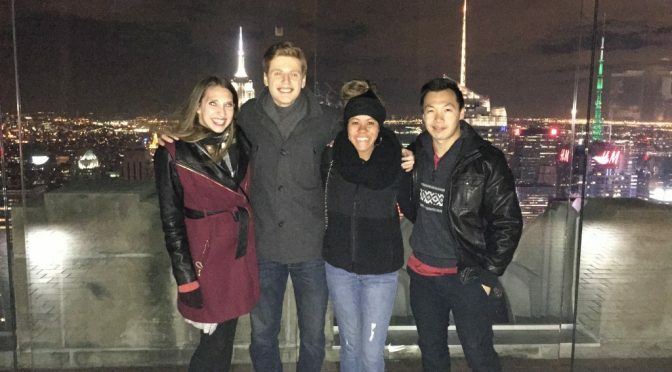 Walton students (left to right) Kelsey Casey, Jack Scaccia, Jessica Fuentes and Hoang Le Dang visit Rockefeller Center in New York during their recent trip to the National Retail Federation’s 2016 Big Show Student Program Jan. 14-17. Students Jessica Fuentes, Hoang Le Dang, Kelsey Casey and Jack Scaccia attended the conference with Center for Retailing Excellence staff members Claudia Mobley, director, and Pam Styles, associate director. Conference attendees heard from senior retail leaders from Belk, HSNi, Nike, Williams-Sonoma, The Home Depot, Macy’s, Nordstrom, Walgreens, Walmart, Kohl’s Corporation and more. Four years ago there were seven university members of NRF, with the University of Arkansas serving as a founding member of the student program. In 2016, there are now 67 university members. Fuentes and Dang earned a conference scholarship through participation in STORE, Students in Retailing Excellence, a registered student organization. In addition, Fuentes received a travel sponsorship from National Retail Federation as the University of Arkansas NRF Rising Star; Dang was the NRF Student Ambassador for recruiting more than 25 members. 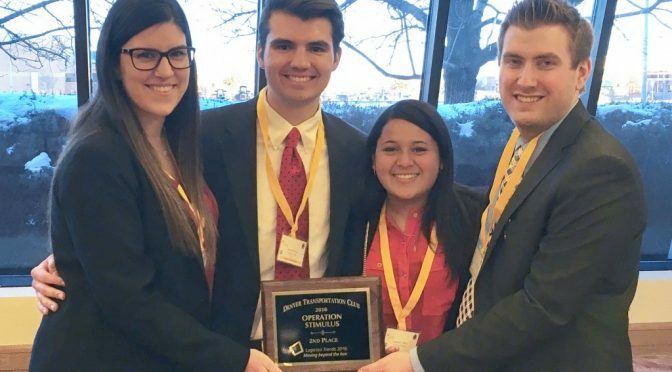 Fellow students Casey and Scaccia represented Enactus, a registered student organization that promotes entrepreneurship as a way to create a better world. Their travel was sponsored by the Center for Retailing Excellence.